I like these candle sconces and want something like them for my fireplace wall- any suggestions on a pair that wont set me back a months rent?? PS- cant remember where this picture came from (I know bad, bad me) anyone know? I have that page dogeared for the pair of stools. Something tells me Traditional Home, maybe???? 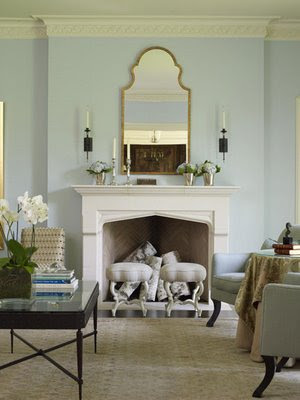 Oooh, I love that living room, and the sconces are beautiful. great sconces! I wonder if by scouring vintage shops/salvation army stores you could find something on the cheap (and spray paint it black if need be). Love those! I would just start frequenting your favorite thrift store. I have been collecting sconces for a while now, and I seem to find one everytime I go to the thrift store. None of them match, but I like an eclectic look. My sister-in-law found a stunning pair though. Give it a shot! Love the sconces. Zgalllery has a huge variety. I wish I had a fireplace. is that from Suzanne Kasler - looks like her stools? but those are Rose Tarlow chairs. you got me beat. Check out circa lighting. or even Target ON line only. you never know! btw- Ben is loving his R. Hardware fan. loves it! I am IN LOVE with this room and now rethinking painting the common areas of our house a tan color. I'm obsessed with light blues, so practically every other room will be a light blue shade, so I guess I can get over it. That mirror is to die for. Oh, and do you have Kohl's up there? Can't say I've necessarily seen any like that, but they always seem to have a ton of sconces. I actually did see something similar at Walmart yesterday when I went for felt pads for my furniture, but they weren't that big. That is a beautiful room! I can't say I've seen the sconces, hmm... will keep it in mind.